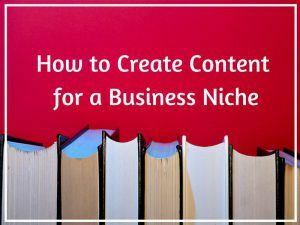 A big part of online marketing is to deliver useful information to the audience and this means you need to learn how to create content for a specific niche. The equation is simple; the more content you publish, the more traffic you get and the more sales you make. So what the heck is content creation and where do you begin? Let me break it down for you. Content is made up of words, hence keyword research is all about finding the right keywords or keyphrases that can help to generate relevant content. If you recalled the page about finding a business niche, we talked about targeting by moving from a broad to a smaller group of audience. The same concept applies for keyword research as well. We take one broad keyword and elaborate it to describe something more specific, a.k.a long-tail keywords. 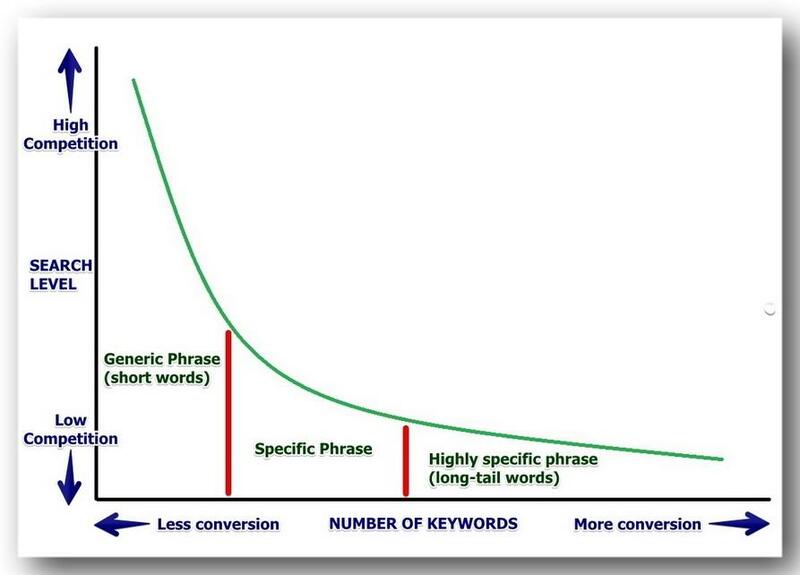 Why are long-tail keywords important for content creation? It has higher chances of matching with other relevant words. It makes more sense from a reader’s perspective. They are less competitive to rank. Here’s a simple graph to show you the potential of long-tail. Coming up with these keywords isn’t difficult, but some brainstorming is necessary at first. One of the easiest and effective ways is to use the Alphabet Soup Technique in Google search. This is something that you can do right from your own browser. Enter 2-3 keyphrases randomly on the search bar and see what scrolls down. Google will predict your queries and provides four commonly searched keyphrases to match what you are looking for. The main point here is ‘commonly searched keyphrases’. You see, when you are brainstorming (most of the time, alone), you can only come up with so many ideas at one time. But when you apply this technique, the initial keywords are extrapolated based on what is typed into Google. So, if people are using these terms to search, then it means they are in demand and that is an advantage for you as a marketer. Now let’s apply this to your business niche. Say you are in the Yoga niche (broad category) and want to use the exercise to help people with daily ailments (specific audience). What would your title be? I am thinking of ‘How Does Yoga Reduce…’ and Google generously offers four ideas related to these keyphrases. These are great topic ideas to write about, but that’s only one part of the process. In order to get your content to rank on the first page of the search engines where the traffic is the highest, you’ll need to know about the competition for that specific keywords. That’s where you’ll be using a keyword research tool to do some analysis. Let’s take the example of ‘How does Yoga Reduce Stress’ to run a quick search using Jaaxy. The competition level is represented by the QSR (Quoted Search Results) metric and for this, there are currently 46 websites ranking for this exact keyphrase. Generally, a QSR less than 100 is a good indicator of low competition. Besides that, you also want to make sure that the average number of searches per month (Avg) is more than 50 and the SEO score is high. This keyphrase matches all the criteria so it’s a good topic idea for content. Now, let’s see what the competition is like for ‘How does yoga reduce pain’. Not bad either, except that not many people search for this phrase (less than 10 searches/month) so it might not be a good topic choice. If you are just starting out, it’s better to pick keywords that has some amount of traffic so that the chances of your content being searched is higher. Now, here’s another good keyphrase that matches our keywords criteria. The QSR is zero, so it’s definitely going to be easy to rank for this one. Pages are articles that provide a basic framework about a niche. They don’t have a date stamp hence they are sometimes called evergreen content. This means, the information within is something that would guide your online business and stays the same over a period of time. While it’s not necessary to create a lot of pages, you do need to break down your sub-niche further into different sections/pages so that it gives readers a clear overview what your website is all about. Again, using the Yoga sub-niche (helping people with daily ailments) for example, here are some of the pages that I think is appropriate for the audience. Also known as blogs, posts are usually dated articles that are content ideas generated from pages. They are published regularly to get reader engagement through blog comments and social shares. Most importantly, they play a big role in getting your website ranked online with all the great topics that you write based on keyword research. Unlike pages, the content in posts can sometimes become outdated. This could happen with product reviews as many niche products come and go. Therefore, it’s important to take note of what’s trending and update your post content whenever you can. To get started, you would take one page idea and brainstorm for 10 potential keywords. What’s the criteria for a good keyword again? So if you have 5 pages, you would eventually come up with 50 topics for your blog and you’ll continue to expand beyond that number. Remember, the more content you publish, the more traffic you get and the more you earn. I hope this article has given you a better understanding of what content creation is all about. Every bit of your online business success revolves around the information that you share and that’s deeply rooted to the choice of keywords that you use. If you would like to get started, simply enter a keyword related to your niche, using the Jaaxy search below, to create your first page and post.